The Buffalo Religious Arts Center is hosting a Spring Concert featuring organ, harpsichord and violins. The concert will be hosted by Scott Hyslop, Director of Parish Music at St. Lorenz Lutheran Church at Frankenmuth, Michigan. Dr. Hyslop called us a few years ago to ask if he could play the historic Schlicker Organ. This will be his second concert at the Art Center. 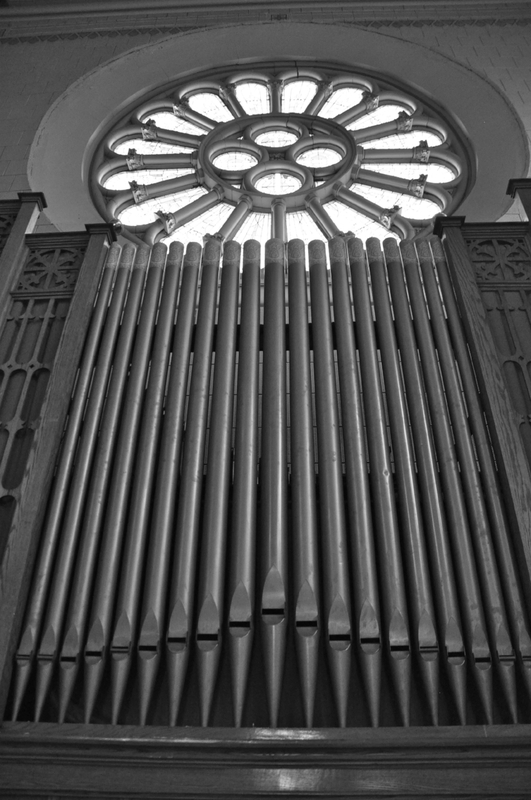 This organ was installed at the former St. Francis Xavier church in 1935. Niagara Organ Works tells us that it still has all of its original parts and has been well preserved. This organ is listed in the Organ Historical Society Pipe Organ Database. This concert will also feature harpsichord and violins and will highlight music by Handel, Lubeck and Mozart. This church building fortunately still has original murals surrounding the main and side altars that were painted by a Bavarian born artist named Raphael Pfeister. The ceiling is still intact and was painted by Hungarian born Josef Vargas who lived in the Black Rock neighborhood in the early 1900's. Many visitors who grew up in this parish tell us the interior looks the same as it did when they were young. The concert will take place on Wednesday, April 18 at 7 pm at the former St. Francis Xavier Church at 157 East Street. There will be a $10.00 donation at the door to help us heat this building. The Buffalo Religious Arts Center was established to collect and preserve fine art from the many houses of worship that have closed their doors in the Western New York area. The stained glass windows, statuary and art work that we are collecting provide a unique insight into Buffalo’s culture as well as artistic history. The Center collects religious art from all denominations, and will appeal to people, both religious and non-religious who appreciate fine art. We are always looking for more volunteers and docents. All are welcome. Also, if you’re looking for a place for your wedding ceremony, the Buffalo Religious Art Center can be rented, offering an elegant backdrop to your special day. Tours of the Art Center are every Saturday from 11am-1pm or by appointment. Please call 716.481.2350 to set up an appointment. If it’s Tuesday, this must be Buffalo. Well, not exactly, but it is Buffalo Day at Chautauqua. It’s the eight annual celebration of the cultural contributions made by the Queen City to both the Institution and the nation. Two Buffalonians who have made significant cultural contributions of their own will appear at 3:30 p.m. Tuesday in the Hall of Christ in a program titled “Creating a Heritage of Faith and Art: The Buffalo Religious Art Center,” as part of the Oliver Archives Heritage Lecture Series. In 2007, the Roman Catholic Diocese of Buffalo announced the closing of a number of its churches as part of a huge reorganization. Mary Holland, a Buffalo native, read about the plan in the newspaper and determined to visit each church before it closed. In 2008, she founded the Buffalo Religious Arts Center to collect and preserve the rich artistic and historic legacy housed in Buffalo’s churches and synagogues. The group restored the former St. Francis Xavier Roman Catholic Church in the city’s Black Rock section and turned it into a museum. Since it opened, the center has acquired works of art from more than 45 churches, including more than 50 stained glass windows. And while most of those works are from Catholic churches, the center exhibits items from any faith. In her presentation Tuesday, Holland will show images from the museum’s expanding collection and discuss the ethnic and cultural significance of how the art was created and preserved. Dennis Galucki is a former investment adviser with Dean Witter who grew up in and around Buffalo and who has become something of a fixture around Chautauqua. His philosophy, he says, is “Invest in Life,” and with that in mind, he created and directs the websites C-SAAHN (the Center for the Study of Art, Architecture, History and Nature, pronounced like the artist Cezanne) and IMAGINE, both of which serve as repositories of lectures, classes, discussions and other educational resources. "Creating a Heritage of Faith & Art - The Buffalo Religious Art Center"
Ticket Office: Mon.–Fri. 9 a.m. to 4 p.m. & Saturday 10 a.m. to 3 p.m.
Mary Holland, founder, Buffalo Religious Art Center. Dennis Galucki, founder of the Center for the Study of Art, Architecture, History and Nature. This lecture is presented as part of Buffalo Day at Chautauqua. Western New York's churches are rich in artistic and architectural treasures, and some of them are on view this weekend outside of worship hours. Ten current and former churches opened their doors Saturday as part of a statewide Sacred Sites Open House Weekend organized by the New York Landmarks Conservancy. One of the prime locations whose doors were open Saturday was the Buffalo Religious Arts Center, the former St. Francis Xavier Catholic Church at 157 East St. in Black Rock. Closed by the Diocese of Buffalo a decade ago, the building was sold to private owners and in 2008 became a museum for hundreds of examples of art and religious artifacts from closed area churches. Normally open only by appointment, the building keeps most of St. Francis Xavier's original art and stained glass as well as pieces donated or acquired from other local churches or private owners. "It's not just Catholic. It's any church that was forced to close for lack of membership," founder Mary Holland said. An Episcopal altar and bishop's chair are on display, as well as a few artifacts from Jewish synagogues, but in line with Western New York's heritage of European immigrants, the overwhelming majority of the items are Catholic. Holland said German, Hungarian, Polish, Italian and Danish artists and artisans are represented in the collection. "It's all the immigrants that came here. It's their story," Holland said. The oldest works are some wooden statues from the 1890s, and most of the collection was made in the early 20th century, when Buffalo went through a church building boom. The city's plummeting population after World War II eventually led to many of those churches closing. Holland said she was especially interested in saving pieces that the churches themselves had forgotten about. "When I went into a church, they'd say, 'There's nothing in the attic, there's nothing in the basement.' That's where the good stuff was," Holland said. But active churches took part in the weekend promotion, too. Delaware Avenue Baptist Church, 965 Delaware Ave., was open Saturday and will be open again from 2:30 to 4:30 p.m. Sunday. The red sandstone church, which opened in 1895, once hosted a congregation that included Buffalo's rich and prominent. It contains Byzantine-style mosaics and an enormous stained-glass dome beneath a skylight. The lavish decoration is "for a Baptist church, extremely unusual," trustee Marilyn Woodin said. The average attendance at the church for a regular Sunday service a century ago was 1,000 people. Today, the typical turnout is closer to 125, Woodin said. The congregation is applying to be listed on the National Register of Historic Places. "We think we're going to get it," Woodin said. "We are very much in need of a roof. There's been a lot of patch jobs over the last 60 years." Other Buffalo churches open Sunday for the Open House Weekend will include Blessed Trinity Catholic Church, 317 Leroy Ave.; Parkside Lutheran Church, 2 Wallace Ave.; and North Park Lutheran Church, 310 Starin Ave., all from noon to 2 p.m. In Niagara Falls, First Baptist Church, 554 Main St., will be open from noon to 3 p.m. Sunday, and the former Holy Trinity Catholic Church, now Niagara Heritage of Hope and Service, 1419 Falls St., will be open from 11 a.m. to 2 p.m.
Other churches taking part Saturday included Kenmore United Methodist Church, Friends in Christ United Methodist Church in Fillmore and St. John's Episcopal Church in Medina. We would like to thank Senator Chris Jacobs for visiting the Buffalo Religious Arts Center this afternoon. From left to right: Benjamin Spitler, Mary Holland, Senator Jacobs, Barbara Miziewa and Ronald Barrett. In order to raise funds for the restoration of the Buffalo Religious Arts Center, a monthly speaker series is being held starting in June. The topics for the events revolve around the churches of Buffalo, their architecture, their respective neighborhoods, and the people that helped them to come alive. As we all are aware, our churches are the cornerstone of our neighborhoods, whether we attend services or not. From the architecture, to the gathering spaces, to the religious messages that they deliver, our churches are the foundation of Buffalo to this day. Can you imagine this city without them? The mission of the Buffalo Religious Arts Center is to secure and tend to this city’s forsaken religious architectural bounty. This is a monumental task that cannot be truly measured. The Buffalo Religious Arts Center is located in the former St. Francis Xavier church which is 102 years old. Doors open at 6:30 speaker at 7:00pm. Admission is $10.00. Lead image: The campanile tower houses 3 bells that were manufactured by Jones Bell, Troy, NY in 1877. The bells are three different weights: 1500, 1100 and 900 pounds. Inset: The Buffalo Religious Arts Center has 4 clock faces. Thanks to Give for Greatness! Give for Greatness has gifted the Buffalo Religious Arts Center! G4G is a program of the Arts Services Initiative of Western New York. Their mission is to raise funds to assist in the operational support of arts and cultural organizations in Western New York. Thank you to Give for Greatness!! Textiles from the Diocese of Columbus, Ohio and the Diocese of Buffalo will be on display May 3 to May 11, 2014. These textiles include vestments, canopies, altar linens, clothing for the Infant a of Prague and vintage textiles made by neighborhood volunteers. The Buffalo Religious Arts Center will host a guest speaker on Dec 7, 2013 at 4:30 pm. Join Chris Brown for an engaging look at the War of 1812 in Western New York. Chris has led tours by bike and boat and now you can join him at the Buffalo Religious Arts Center for his take on this important conflict. There will also be a tree lighting at Market Squareat 5:20 pm. The stained glass Stations of the Cross. Buffalo’s rich ethnic heritage is reflected in the many churches located throughout the city. Early settlers, including those from Germany, Poland, Italy and Ireland, brought their style of churches from the “Old Country.” Most of them were working class people who donated what little extra money they had to help build these magnificent church buildings that have features such as beautiful murals, stained glass windows and statues. However, in 2007, a number of these mainly Roman Catholic churches were slated to close during a massive reorganization of parishes in the Diocese of Buffalo. Mary Holland read about these closings in the newspaper and felt compelled to visit each church before it closed. She realized that if no one in Buffalo stepped forward to save these items, they probably would be sold to buyers out of the area. Inspired by a visit to the renowned E.B. Smith Stained Glass Art Museum in Chicago, Holland founded the Buffalo Religious Arts Center in 2008, with the mission to preserve the artistic and historic legacy of Buffalo’s immigrant culture and religious heritage. The center, which collects religious art from all denominations, is located in the circa 1912 former St. Francis Xavier Church in Buffalo’s historic Black Rock section. It is in the perfect location according to Holland: “It’s just off the expressway, easy to find and close to downtown.” The center is one of the first galleries in the United States dedicated to the preservation of religious arts that is housed in a former church. The first thing you notice when you enter the center is the mural work behind the altar. The upper level depicts the Holy Trinity, while the central portion portrays St. Francis Xavier. The lower level of the mural features other saints and the 12 apostles. There are also murals behind the side altar areas. Holland relayed an interesting story about one of those murals. To verify this information, Holland drove to D.C. to visit the National Shrine and speak to the curator. Holland added that the building and artwork is a blending of many cultures. One of the unique features of the center are the stained glass windows. Only a handful of churches in the world have windows like these, which depict the Stations of the Cross. The windows were crafted in Munich, Germany, by F.X. Zettler and have pieces of wood affixed to the upper crosses in the windows, as according to church law, there must be some wood in the Stations of the Cross. Since the center opened, Holland and her staff of mostly volunteers have acquired items from more than 45 churches. The Buffalo Religious Arts Center is one of the first museums that specializes in artifacts from closed churches. When a church closes, the items from that church first go to other churches in the area that remain open. Items that those churches do not choose to keep are sold to other churches or priests, and then the remaining items are made available to the arts center. Sometimes the items are donated, and other times they must purchase the items. So far the center has more than 50 stained-glass windows, including several from the now-closed Queen of Peace Church. Six of these windows are mounted in frames that are backlit; several are displayed in the confessionals. While the majority of items in the center are from Catholic churches that have closed, they accept items from any faith. Buffalo Religious Arts Center is located at 157 East St., Buffalo; for information, call 481-2350 or visit www.buffaloreligiousarts.org. Tours are available by appointment. During the summer the center is open on Saturdays; see the website for times. The center can also be rented for weddings. From the former St. Agnes school has been brought to the Art Center by Mary Holland and Bill Meldrum. The school closed in the 1960’s and was located in the Lovejoy district of Buffalo. This beautiful autumn afternoon ceremony celebrated the joining of Nicole Lovett and David Holland amid stunning decor styled by the bride herself. Full-length bridesmaids’ dresses of a deep wine color complimented floral arrangements centered on lush red roses. The short Protestant ceremony, officiated by Pastor David Persons, was attended by 160 guests and followed by a reception at Asbury Hall. Mary Holland, founder of The Buffalo Religious Arts Museum located at 157 East Street of the “Black Rock” community in Buffalo, opened the paper in 2007 to see a two page article on local churches closing down. The article’s accompanying pictures spoke to her even more than the text. Holland had heard horror stories of stained glass windows being kept in awful condition in Las Vegas and baptismal founts being used for coolers. All of the outstanding historical architecture within these buildings had to go somewhere. These pieces of art had to be worth more than a price tag during a liquidation event or a few weeks’ pay for a demolition squad and some gas in a bulldozer. She knew she had to do something, and fast. “If I could only save one piece, I would,” she thought. The Museum, purchased in 2008, was formerly known as “The St. Francis Xavier Roman Catholic German Church.” The parish itself was founded in 1849 primarily due to the parents of German-speaking children wanting a school. So before the church was even constructed, a school had been built on the premises. When Holland walked through the doors of the church for the first time her attention went straight to the murals on the back wall. “We can’t turn the heat off,” she said. If they did the murals would begin to fade and peel away. And then it clicked; this building would no longer be a church, but a museum. It could be used to preserve and protect artifacts that should not leave Buffalo, and so it has. It is a three-step process: preserve the building, obtain artwork from closing churches in the area, and preserve the art as well. Buffalo has lost approximately fifty churches. In recent years, the total count could top a thousand closed doors from Northeastern cities alone: Chicago, Boston, Albany, and Columbus Ohio to name a few. Holland has done an outstanding job, collecting work from Bavarian-born, German-born, Italian-born, and Polish-born artists. Diverse in nature, this historical collection is resonant of the countless numbers of European immigrants that came to this country or Buffalo in particular, in search of a better life. “My dream would be that people understand the importance of this art and architecture and that they come to Buffalo to see these churches that are still standing. People will go to Europe to visit churches that have nothing to do with how religious or non-religious they are, people just go there. I think they can come to Buffalo because we have some pretty outstanding buildings,” said Holland. To better get an idea of what this ethnic-rich atmosphere feels like, feel free to check them out online. Also, Squeaky Wheel, a nonprofit media arts center, is featuring a program called the Buffalo Youth Media Institute. This program challenges children grades eight through twelve for three months every summer to create their own documentaries. The presentations of their finished work will be held at the Burchfield Penny Art Center on Sunday, September 15th from 1:30 P.M. to 4 P.M. and Participant Noah G Williams has chosen to do his project on Holland’s Museum.